Q1. How to use tail? Q2. How to change number of lines tail prints? Q3. How to make tail output a set number of bytes? Q4. How to make tail follow log files? Q5. How to force tail to keep trying accessing input file? Sometimes you want to monitor what new information is being written to a file (think of log files), or for whatever reasons, want to access the last few lines of a file. Well, there's a command line utility that lets you do this in Linux, and it's call tail. In this tutorial, we will discuss the basics of the tail command using some easy to understand examples. But before we do that, it's worth mentioning that all examples included in this article have been tested on Ubuntu 16.04 LTS. a header giving the file name. With no FILE, or when FILE is -, read standard input. Following are some Q&A-styled examples that should give you a better idea on how the tail command works. 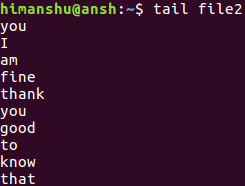 As you know by now, the tail command prints 10 lines by default. However, you can change this number using the -n command line option. What if instead of lines, you want tail to deal in bytes. I mean, what if the requirement is to print 20 bytes? Well, this can be done using the -c command line option. If you want to use tail to follow updates to a file (say a log file) in real-time, use the -F or --follow command line option. Note that -f is equal to '--follow=name --retry'. a way that accommodates renaming, removal and creation. Sometimes a file may be temporarily inaccessible, something which can happen due to a variety of reasons. To make sure tail keeps trying opening the file, use the --retry option. So that's how the tail command works. Hope you'd have enjoyed the tutorial, as well as learned useful stuff from it. We suggest you try out these examples on your Linux PC, and then head to the tool's man page for more info.